Tis the season for parties and entertaining! Yesterday, Laurel and I hosted our second Booster Brunch (deets will be coming soon on the blog!). 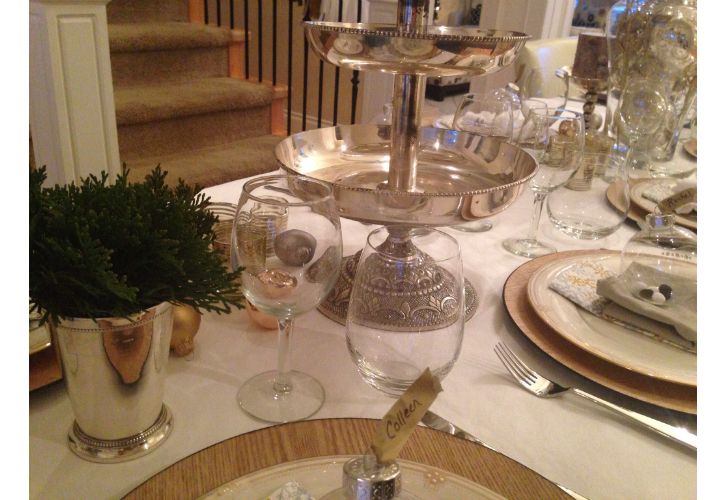 It got me thinking about some things that make entertaining for the holidays a bit easier…. 1. “Brand” your party. Create a theme and work things around it. A theme also helps to give some direction. For our brunch, our theme was “JOY”. 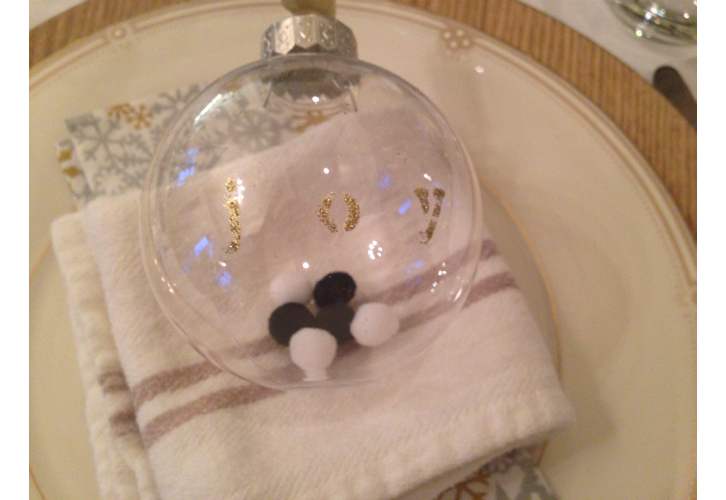 Laurel created take home ornaments that doubled as place cards. 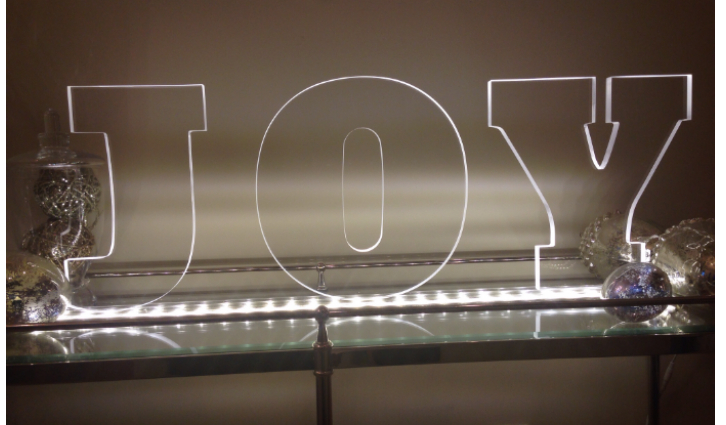 I created a sign…ok, a bit of a splurge, but it think it’s going to stay put beyond the holidays. Our dear friend spoke about finding joy in the middle of really hard stuff! 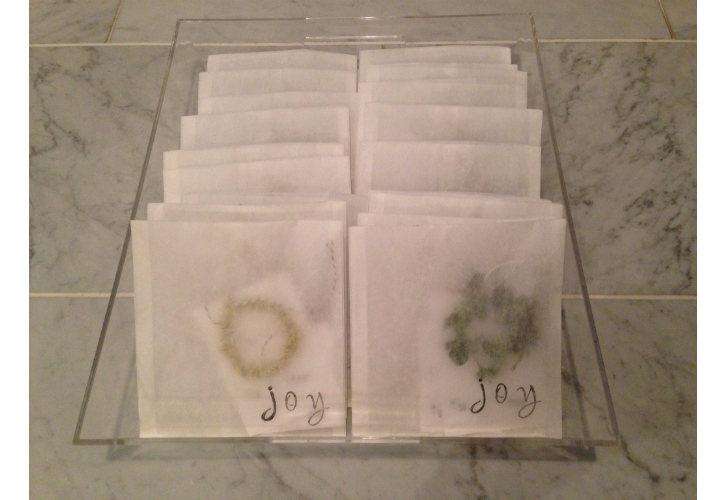 We also stamped “joy” on the treat bags with gift tags that Laurel made (yes, she’s MUCH craftier than I am!). These are simply sandwich bags from a restaurant supply store that we stamped! 2. Pick a color theme. For our brunch, we went with black, white, silver and gold. This for me is all about trolling dollar stores and Target! 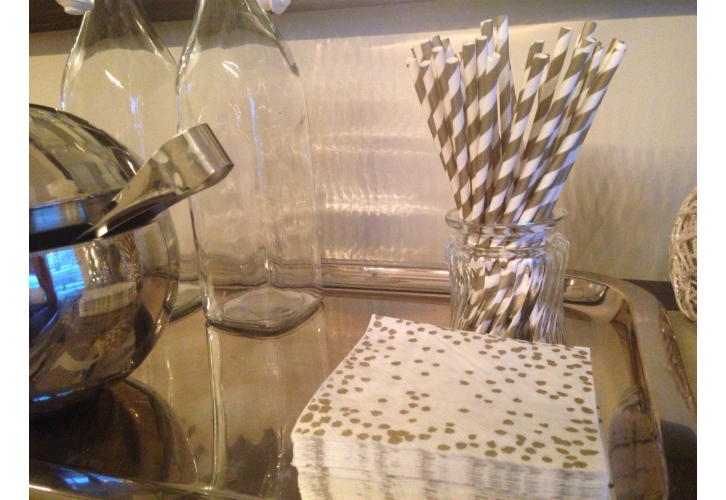 Striped paper straws and napkins are easy ways to inject color into your party. 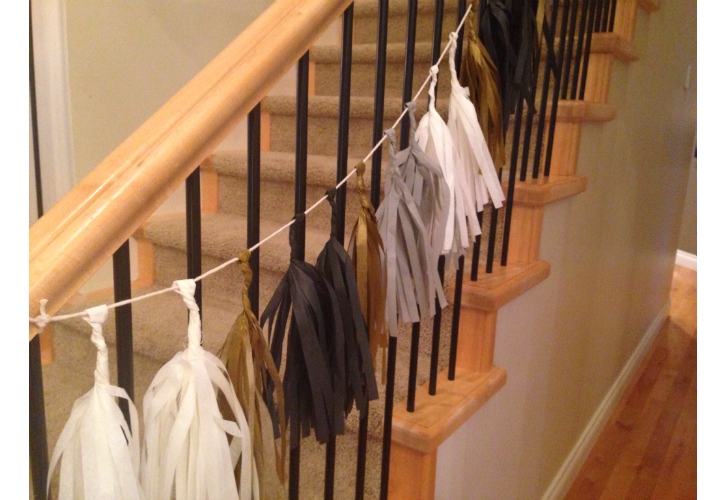 I also added this tissue paper tassel garland up my stairway from Confetti & Sparkle Party Shop. Cindy from Confetti has a great selection of fun and colorful things for your next event. And Abbotsford sisters…she’s local!!! Yahooo!! 3. 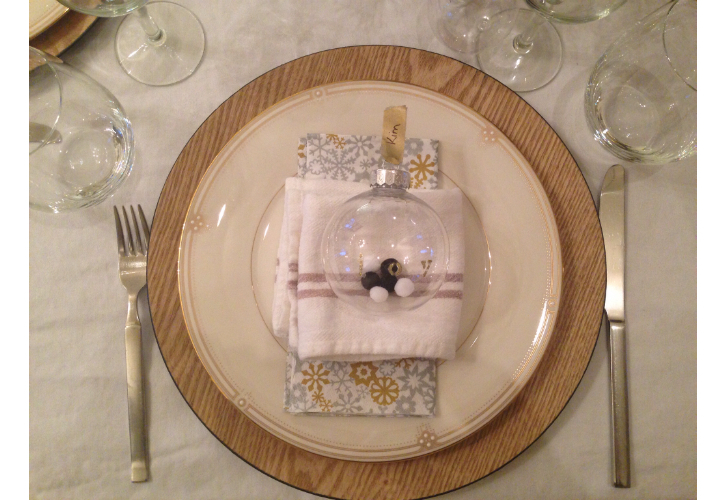 If you are buying pieces, look for things you can use for events at other times of the year. I invested in these wood chargers from President’s Choice. They were $4 each, but Lo and I split them and I know that I will use them over and over again. Our friend mentioned that she had just bought 11 of them for her Christmas party, so between the three of us, we have 33 chargers…perfect for larger groups down the road. 4. Pick menu items that can mostly be made the day ahead. For our brunch, I came up with a beef short rib skillet topped with an egg. The beef short rib part was totally made the day ahead. I just had to reheat it, portion it out and add a few things on top!! 5. It’s ok to purchase some food too!! We wanted authentic English currant scones and clotted cream for our brunch. Yes, we could have made them, but there is a place in Abbotsford called the Clayburn Village Store & Tea Shop and they make the best! Laurel called them in advance and they aren’t normally open on Mondays, but they graciously accommodated us!!! 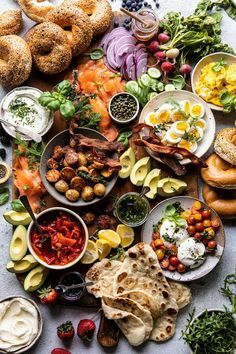 We ordered It’s to Die For Banana Bread and Lemon Loaf for our last brunch…seriously, I can’t make either of them that well, so why stress out trying?? If you are planning on purchasing anything at this time of year, I recommend ordering ahead. Ok, and I will NEVER try to make pretty sugar cookies again…..Pam MacGregor’s Cookies are works of art and taste amazing…..they are worth every penny…or shall I say nickel! Ordering specialty items still takes time and effort and your guests will appreciate it! 6. If people offer to help or bring something, don’t feel badly accepting! Our friends often offer and we love to bring things to their parties too. For the brunch, our friend Denise offered to help and I had the perfect job for her! 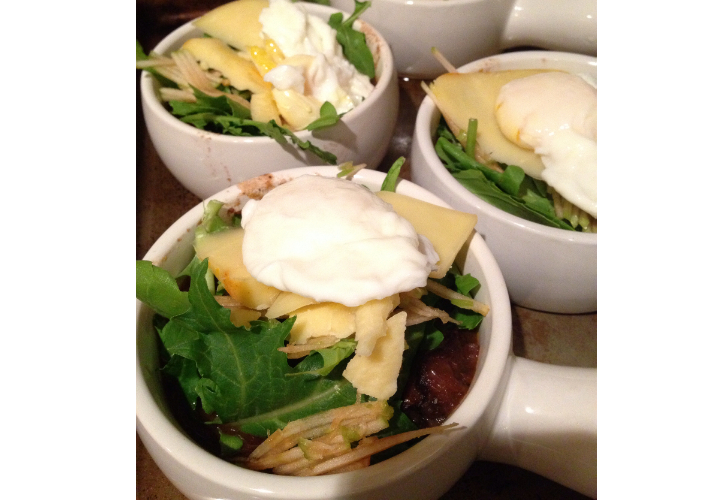 We planned on making lavender lattes but I was worried about manning the espresso machine and prepping the food! Denise was all over it!! Problem solved! I think she may secretly want to be a barista! 7. Chill out!! Ok, I had to tell myself this yesterday when I was frying eggs for 21 people!! Who seriously does that? But really, everyone was fed, the food was hot and everyone seemed happy. I tend to turn into a crazy person right before guests arrive, so I really need to relax and remember that it’s really about getting together and visiting!!! No one is expecting me to be Martha, except maybe me!